Most of us would say we want to be successful but success means different things to different people. For some, it’s all about material success and that seldom goes beyond money, cars or big homes as the key to fulfilment. For others, success is much more about happiness or satisfaction or emotional reward. Regardless of how differently people perceive success, virtually everyone wants it. You must have your own definition for success. However, you don’t have to be dogmatic about this – you may notice that it changes over time; perhaps even as you work through these exercises. • Bob is a 32-year old store assistant. His wife Anne is 30 years old and works in the administrative section at a small local firm. They live in their small suburban home with two children. Bob leaves his store at 6 pm every evening and is greeted by his wife at the door with a kiss and a hug. Bob finds time to play games with his children and every night reads them a story.Despite financial constraints, the family goes on a vacation every year. They spend a lot of time together. • Jane is a 28-year old single woman. Her job as a financial analyst enables her to maintain a smart city-centre apartment and own a Lexus. She could afford a holiday anywhere in the world, though she rarely travels anywhere if it’s not on a business trip. Her hectic workload seldom allows Jane to reach home before 7 pm or to go out for a party. Lack of socialization often gives her a feeling of loneliness, though she believes that the money makes up for it. She is ready to put aside her personal feelings for a career that gives her enough money and social status. Who do you think is successful of the two – Bob or Jane? , then you would probably select Bob, the happier one with a contented and fulfilled life. Compare your selection with the definition you have written in the box above. You will probably see that your selection and your definition have a lot in common. • Upbringing: Everyone perceives things on the basis of the values they have learned in childhood. • Beliefs: Beliefs, deep-rooted in your mind, affect the way you perceive things. • Traits: Particular characteristics that distinguish you or that are genetically determined will also influence the way you view things. • Attitude: Everyone has opinions or general feelings that affect their thoughts and actions. • Peers: Your family, friends, coworkers or whoever you maintain a constant contact with can influence the way you perceive things. • Society: The views and attitudes of other people generally have a significant influence. • Life experience: Small or big, each and every experience in your life influences the way you perceive things. Are we born to be winners or losers? There is a myth that states that people are born winners or born losers. Nothing could be further from the truth. Nobody is born just to win or lose. The way you live your life makes you a winner or loser. Using self-improvement techniques and methods can positively influence your attitude, behaviour and personality leading you to the destination called success. More often than not, you are responsible for what you get from life. Even a single sensible timely step can change the entire scenario. You need to sense what the situation demands and act accordingly. To achieve the success you want, you need to know where you are going and then constantly check to make sure you are moving in the proper direction. Creating a vision and a mission statement of what you want out of life will provide you with some direction and momentum to move forward. It can act as a catalyst in accomplishing your task. • If you are driven by a compelling vision, you have a greater chance to feel good about yourself. • If you have a true mission or sense of purpose, you have a better chance to know where you are going in your life. • When you feel you are in control of your life and events, you will naturally feel more confident and motivated to achieve more. A clear vision and a well-defined mission will help you realize the real purpose of your life. Both your vision and mission should express your purpose for existence. • As a child, what did you dream of becoming? • Which three people do you think have influenced your life the most and why? • If you could choose your career and get paid whatever you wanted, what would you opt for? • What are your top three achievements in life so far? What was so special about them? • What activities make you happiest in life? • Who are the three people who you admire the most? What are their characteristics and qualities you admire so much? • Have you ever helped someone less fortunate than you? If yes, what did you do? If no, why not? • List out your greatest strengths. • What steps should you take in life to maximize your strengths? • What is that one thing for which you would be willing to put everything on the block? Why? • Imagine that all the time you spent till now comes back to you. How would you use it now? What would you do with the time this second time round? • What results and events in your life are you most happy about? Which are you most unhappy about? • Is there a word of advice you have picked up from your life so far that you want to pass on to the world? • Name one thing you value the most in life? • What would you really like to do with your life? The point of getting you to think about those questions is to get you to think about what you want from your life. It would be easier for you, after answering the questions, to realize what you want from life and how you are going to get it. Take your time, go for a walk, or take a short break. It’s better to get away from the routine environment. Remember, your mission in life is far too important to be skimmed over. A mission statement needs to be honest. Make sure you actually believe in your mission statement. If you don’t, it’s a lie. Don’t cheat yourself. Elvis Presley, also known as "The King of Rock 'n' Roll," was a giant in the modern entertainment industry. Few people influenced popular culture like Presley. Wealth, fame, women, success … all the pleasures of life were plentiful in his life. However, when Presley died by overdosing on drugs, he was only 42 years old. Despite all his successes, he followed a self-destructive lifestyle. Presley was a man who owned what others dreamed about. His success was legendary and his achievements were enviable. However, without a sense of fulfilment, there is no joy. 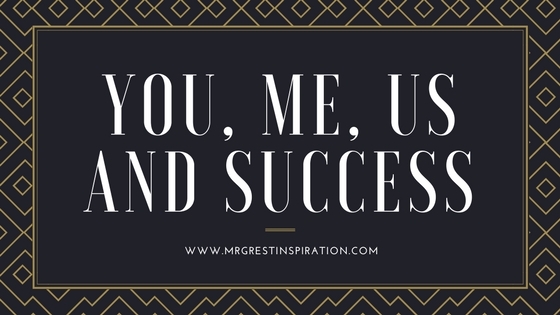 We hope guys you find our article "You, Me, Us and Success" by Mr Great Inspiration useful.